PHOENIX — 1968 was a prominent year in history for many reasons. Over just a few months, Rev. Dr. Martin Luther King Jr. and presidential candidate Robert Kennedy were assassinated, the Vietnam War continued on, there were student riots in France and Mexico City, and there was a display of athlete activism by Tommie Smith and John Carlos at the 1968 Summer Olympics in Mexico City. The pair of American sprinters raised black-gloved fists in the air in support of black power. Tuesday night, Arizona State’s Global Sport Institute and the Center for the Study of Race and Democracy hosted “1968 to 2018: Raising a Fist to Taking a Knee”, an event tracing a 50-year timeline of athlete activism from the iconic moment of raising a fist at the top of the 1968 Olympic podium to Colin Kaepernick taking a knee during the National Anthem. Speakers at the Phoenix Art Museum including Dr. Harry Edwards, a leader of the boycott of the 1968 Olympic Games, Carlos, one of the two Olympians who raised a fist in protest of racism and human rights, Wyomia Tyus, first back-to-back Olympic 100-meter champion, Lance Wyman, graphic designer of the iconic Mexico City 1968 Olympic logos, Gina Hemphill-Strachan, granddaughter of four-time gold medalist Jesse Owens, and Paul Hoffman, 1968 and 1972 Olympic rower from Harvard who supported Edwards’ movement. Both Smith and Carlos were students at San Jose State University at the time when Edwards had led a campaign to boycott the Mexico City Games. The plan heading into the Games was if they were to medal, they would stage a protest against racism and injustice on the world stage. As Smith and Carlos were awarded the gold and bronze medals for their performances in the 200-meter race, they staged a silent demonstration against racial discrimination in the United States by bowing their heads and each raising a black-gloved fist during the playing of the Star Spangled Banner. However, their protest did not stop with their fists. They also wore black socks with no shoes and on their clothes were badges of the Olympic Project for Human Rights, a group dedicated to fighting racial segregation and racism in sports. After their protest, Carlos and Smith were ordered to leave the Olympic Village and faced years of repercussions, including death threats, and were banned from competing in all Olympic-sanctioned events. However, Carlos recalled how, at age 23, the activism he shared wasn’t about himself. 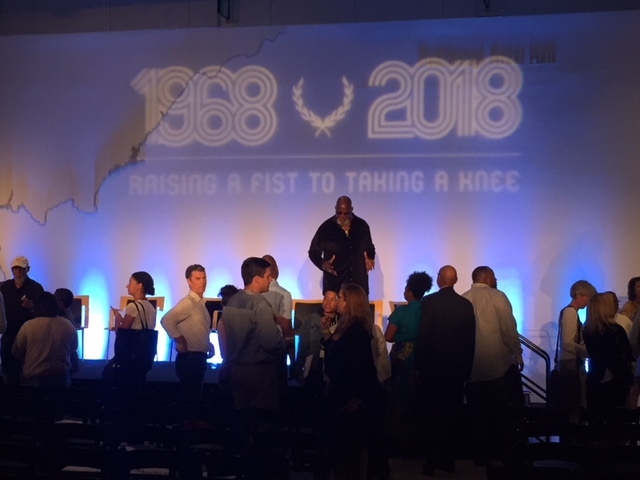 “1968 to 2018: Raising a Fist to Taking a Knee” featured three panels of speakers that discussed the athlete activism that took place in 1968 as well as how athlete and female activism is still prominent today through the Black Lives Matter and the #MeToo movements. The first panel was moderated by Professor Scott Brooks and featured Edwards and Hoffman as they discussed how an unlikely partnership turned into a friendship that further shaped and merged races together in support of equal civil rights for all races. Hoffman was a rower at Harvard University who had heard of Dr. Edward’s ideas to boycott the 1968 Olympics to protest racial injustice. In turn, they invited Dr. Edwards to Harvard before the 1968 games to discuss their commitment to support and sympathize with Edwards and his movement. Dr. Edwards always believed that his civil rights movement should be inclusive among all races. That’s why he agreed when Hoffman and the Harvard University rowing team asked to meet with him and to join his Olympic Project for Human Rights. In turn, Hoffman told Dr. Edwards that he would write to every member of the Olympic team to try to start a conversation about racism and injustice. Unfortunately, his letters did not draw the reaction he had hoped for. “One of the alarming things to me, in retrospect, is ‘you dropped the rock in the well, and you never heard the splash,'” Hoffman said. While Hoffman never medaled at the Games, he can best be remembered for giving Peter Norman, the Australian silver medalist who stood in between Smith and Carlos on the medal stand, his Olympic Project for Human Rights button to wear during the medal ceremony. The second panel was moderated by Dr. Edwards and featured Carlos, Tyus and Hemphill-Strachan. Edwards and Carlos discussed what it took to overcome the adversity as a result of their movement during the games. Tyus also discussed her contribution to the movement by wearing black shorts instead of the white shorts that were a part of their uniforms during her 4x100m relay as a symbol that she stood with Carlos and Smith and their movement for racial justice. Even though Tyus was the first athlete to win back-to-back gold medals, she still felt that her achievements were overlooked. Dr. Edwards also discussed how one of his biggest regrets throughout his movement was not involving female athletes as much as he should have. Hemphill-Strachan, granddaughter of the legendary Jesse Owens, also talked about her grandfather’s contribution to the protests in 1968 and how he actually asked the black athletes to refrain from protesting during the games. “He understood what the black athletes were feeling,” Hemphill-Strachan said. “But he was in a position where he was sent there to try to get them to change their minds. However, he knew once he got in there that there wasn’t going to be any change. The third panel was moderated by Dr. Lois Brown and featured Wyman and Dr. Edwards. Wyman discussed the events leading up to the 1968 Games and how he came up with the idea for his graphics. “The inspiration for the graphics came from a lot of the Mexican artifacts and the culture,” Wyman said. Wyman also discussed that at one point he almost felt guilty for working for a government that was out killing students. On the other hand, Wyman had spent three years working on the graphics for the Olympics, and he did not want to see that get lost. For a lot of years, Wyman felt dirty for continuing to work for the Mexican government until 1986 when he gave a talk at the University of Mexico, and someone from the school came up and apologized to him and gave him a book of all the student’s graphics for the anti-government movement. “It wasn’t until that moment where I felt a weight was lifted off my back and it was such a powerful experience that I started crying,” Wyman said. “There are no final victories, but with all of these things we went through, we came out better,” Dr. Edwards said.